But the dust on my boots and the rhythm of my feet and my heartbeat Say Africa . Inspired by mud painted strip cloth, joined with a patchwork of African fabrics and embellished with goodies from Nairobi market. 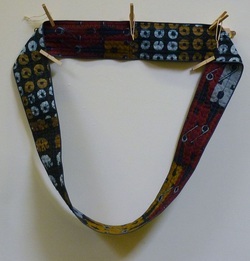 My husband Graham said, ‘All I can see is strips’ – hence the name, which in Swahili means ‘strips of cloth’. I met Alison many years ago, when I judged her quilt as the winner in an ‘African Challenge’ at a Quilters’ Guild Regional Day. We next connected in Nairobi when the Kenya Quilt Guild invited me there to teach. Alison and I both seem to have Africa and quilting in our blood, which is probably why we’re such good friends. 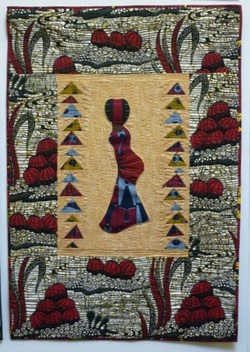 This quilt marks the beginning of my journey of discovery using African textiles. I feel particularly challenged and inspired by wax print: how can I use the bold designs and colours and integrate them into my own artistic style? There may never have been an African Fabric Shop, if it hadn’t been for Janice’s support and encouragement. She insisted that I bring my suit case full of African fabric scraps along to Marsh Quilters and the African Fabric Shop was born. Janice always looks forward to staying over because she gets to sleep in the African Fabric Shop. It shouldn’t be hard to guess who I was thinking about when I made this new piece using – what else? – African wax print. A foundation pieced string quilt based on a traditional technique where I could use up small scraps of fabric – 8 ounces in total. Inspiration came from hexagon wall tiles in the V&A cafe and the gem room at the Natural History museum – hence the name Beryl after the semi-precious stone. Made for my niece, so lots of the fabrics have meaning for her: the pen and paper fabric, as she is a journalist, M is her initial and, of course, shoes! Hand stitched over approximately six months as the final piece for my C&G certificate. I designed this piece as a ‘mystery quilt’ project for some of my students. The idea is that you can keep adding to it or stop at any stage and still have a finished piece of work. I’ve used one of my favourite methods for selecting fabrics – just throw the stash at it! I started this quilt in a Janice Gunner workshop – just having fun playing around with the fabrics. 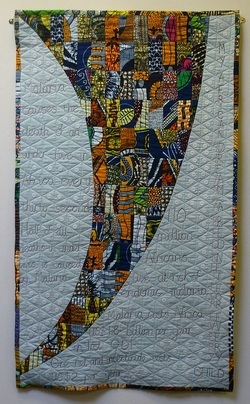 The theme ‘African Dreams’ for a quilt show made me ponder the dream of eradicating malaria in Africa . The quilting and the buttons represent the anti-malaria tablets that are still mostly for tourists, not Africans. I met Isobel at a Quilters’ Guild Regional Day, only to discover that she lives in the next village! Since then, we’ve become good friends. She’s helped me at shows and pitched in to ‘man the shop’ while we’re in Africa . She came to quilting via embroidery and was not one for patterned or printed fabrics, but I soon converted her to African fabrics! Patchwork, for me, is all about working with the fabrics: cutting them up and puzzling them back together again. That’s Flower Stems: take the same African wax print fabric in four colourways, cut up and reassemble – then quilt! Indigo Road is from a pattern called ‘Drunken Nine Patch’ by Lynne Edwards. I thought it would look good using my collection of indigo wax prints. wax print – a perfect case of ‘less is more’. I machine quilted using metallic thread, then applied the contrast fabric. Inspired by the queues for the shuttle buses leaving the Festival of Quilts: ladies of all descriptions – tall, short, fat, thin, able-bodied and health-impaired – all revelling in the delights of fabric shopping! Techniques and materials as for Grasslands. Helen amazes me, constantly juggling her busy work life with an even busier creative life. The inspiration she finds in the fabrics is – well, inspiring. And so are her quilts. Pieced and fused, machine and hand quilted. Materials include hand-dyed cottons, abacca tissue, beads, wire, mulberry paper, laminated paper, garden cane, acrylic paint, beads, Perle threads and – of course! – the wax print scraps left over from Leaving The Accra Quilt Show. What happens when you mix quilters, their husbands, a wacky African wax print and a couple of bottle of wine? Somehow the men got involved. Peg titles were thought of and put in a hat – we each picked one out. This quilt brings back the childhood memory of going to the cinema with my grandparents to see Audrey Hepburn and Rex Harrison in My Fair Lady. In other words, I got the quilt finished on time! Inspired by the time I pegged my trousers out to dry on an electric fence. Burned those trousers up real good! This is my first quilt. Before I retired, I spent my working life in science, so I thought it would be a fitting challenge to make a quilt shaped like a Mobius Loop. Here it is: the world’s first never ending quilt! I always said ‘pegs would fly’ before I ever did a Sunbonnet Sue quilt. Well, here she is: the one and only black African Sunbonnet Sue, surrounded, of course, by flying geese – what else?